Intrinsic to the human experience, there is an unshakable, almost restive disturbance at our core that constantly tells us that there has to be a higher, more transcendent form/entity w/ self-consciousness that may allay our burden of feeling so alone in the universe. This pallor of existential dread that frames our lives is what is articulated both subtly and artfully in some of the best written psychological thrillers, which do a great job at bringing these secret thoughts and disturbances of the human psyche to light. And once again, The Glittering World– a wonderfully terrifying supernatural, psychological thriller- is yet another well-written, cerebral, even unnerving psychological thriller from Simon and Schuster that does just that! Combining four different, unique perspectives who each witness the mysterious supernatural, surreal phenomenon occurring in a small town in Nova Scotia, the reader is given four very fluid stories that finely fuses the traumas of these character’s pasts with the story of how each of them are psychologically experiencing the events happening all around throughout this story. The story is set in a Nova Scotia town, where there is an esoteric group of hippies in the town, known for supposedly having made communion with the “Fey” or the faeries that are said to live underneath the mountain near this small town. These Fey or Faeries are the central antagonists of this story, though they’re much more complex than just mere adversarial bogeys. They are neither completely benign nor completely evil, as this story focuses more on the perceptual grey area that represents how the supernatural is perceived through the human psyche. But their mythology still plays a rather interesting role, nonetheless. The Fey’s origins are depicted in mythical language, in that these faeries have purportedly existed long before the emergence of self-conscious human beings. There are excerpts of songs and poems, included in the story, which shed deeper meaning into the mysterious presence of these faeries in the lives of the inhabitants of this Northeastern Canadian town. Songs, stories, poems with enchanting, mysterious, elusive passages, phraseology have long been a part of horror stories, adding to the element of mystery, and even wonderment that is the channeling emotion that really draws the reader into these sorts of stories. If we didn’t have a strong yearning for the mysterious, neither ourselves or the characters of this story would care about these faeries, or about a kooky newspaper written by some the eccentric members of the tribe that sheds some skeptical light into these faeries. In the story,there is even a slight nod to Octavia Butler’s fabulous Xenogenesis series (one of my personal favorite scifi series), which is revealed towards the end of the first perspective section of the story, the section that concerns the character of Blue, and his mysterious, traumatic past. But this story opens the door to his rather complicated, though relatively unknown connection with the faeries that inhabit this area , and this is the part that alludes to a significant motivation for the alien’s chief interest in other species besides themselves. Blue is the one character who appears to have drawn several people from his life on this yet undiscovered journey into the terrain of the unknown. And it is his. slow, gradual psychological breakdown that occurs all the way up towards the end of the chapter for Blue that induces madness for the other characters of this story. Their exciting,though terrifying perspectives of the events that transpire is in some ways shared by us because we initially get anchored into Blue’s perspective. And our mixture of doubt, unease, curiosity and even terror, is mirrored by the way we first feel about Blue in the story. He is the focal reference for how we perceive everything else, through everyone’s else eyes, and this neat technique is well utilized by Robert Levy, to avoid making what could have been a convoluted mess of a psychological thriller feel tightly-plotted, and very exciting. Even when you believe that these faeries are very real, the mind-bending,psychological intensity and ingenuity of the novel makes you wonder about just how tangibly real the faeries are in this story are, and what they really represent psychologically to each of the characters, and weirdly to yourself. Throughout many stories featuring the supernatural, we have always envisioned either aliens, faeries, or some other mysteriously smarter, more mysterious foe, friend, or fiend as being a form of sentience that may befriend us, or prove to have a terribly complex, psychological terror of a relationship with us. This potent psychological vibe in this story reminded me fondly of a wonderfully-written X-Files episode, in which we get a wonderful dichotomy between skepticism and pure superstition, as Robert Levy uses the psychological responses of the characters to the inexplicable things happening around them as a way to heighten the psychological terror and unease of the whole story. This is where he really succeeds with keeping this story riveting and deeply fascinating, as the monsters in these well-fashioned psychological thriller, which is both haunting and oddly mesmerizing/enrapturing at times, are not merely mindless monstrosities to fend off through boring action scenes, but manifestations of one of the four character’s various terrors. Sometimes, the descriptions of the Fey making their first appearance are written in a rather tedious, verbose way, making it hard to visualize them, and that is really the only thing that impedes this fast-moving, slightly scary first novel from a very skilled first writer. I am a huge fan of novels of this kind, which prove to not just simply be supernatural “monster of the week” romps, but instead transcend those boring, hackney limits, and instead strive to actually create a psychologically substantive work that offers us a much deeper, even more existentially terrifying message at the core of the story. And when you’ve returned from the abyss of this deeply moving, thought-provoking, existential dread driven novel, you won’t just feel uneasy with terror, but l increasingly terrified by the grim reflection this novels offers back. 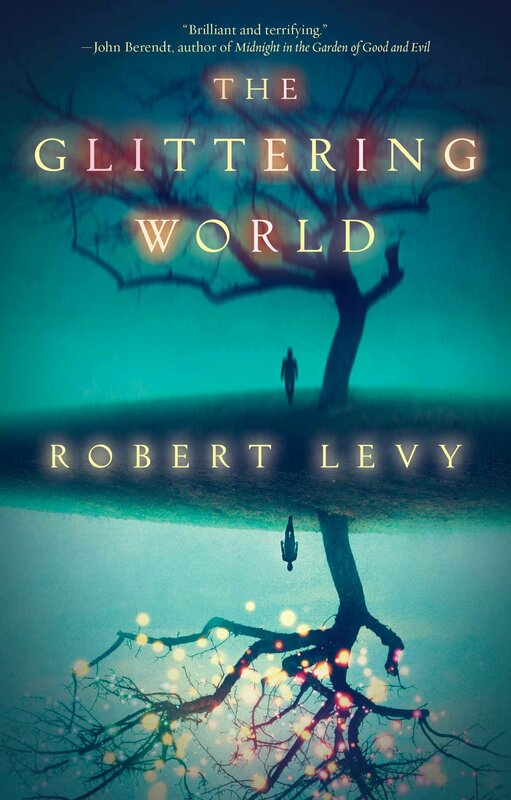 The Glittering World is definitely a great novel for those looking for something that could coexist in both horror or fantasy, but it is mostly a cleverly written,thought-provoking psychological thriller that would interest fans of novels by Peter Straub , HP Lovecraft and other contemporaries of this genre. My main reason for having so much respect and ardor for the horror and psychological thriller genre is their ability to plumb the deepest cavities of the subconscious, and I think The Glittering World succeeds on that level of being lucidly reflective of the terrors that obsess us. Click the picture below for more information on this specific recommended tea blend! The Energize Tea Blend, from Integritea is aptly named, as the tea contains Green Tea and Gingseng, serving to double the energy-enhancing effects of your regular, more sober green tea blend. So in order to remain psychologically impervious to the tempting allure of the faerie’s mystifying essence, this tea will also shield you from their mind-altering effects. And it will of course generally help you to stave off the terror of reading the blood-curdling descriptions of how they appear to the human psyche (grotesque and without skin), when they finally reveal themselves in your worst nightmares. These faeries are neither benign nor entirely evil, so that is why I am recommending this blend for you, which is not just conventional green tea, but green tea serving to help you shield your mind against the powerful charms of the dangerous Fey in Robert Levy’s new supernatural thriller. You cannot survive this novel without this tea! Believe me! Next Post Steampunk Month on A Bibliophile’s Reverie-Celebrating the Most Zany Artistic Aesthetic Around! Wow! This sounds a really chewy read… thank you for the detailed review. Absolutely LOVE the book cover – I think it’s one of the best I’ve ever seen. It’s a wonderful read, and the cover is really beautiful. Quite love it.